We’re delighted to announce the PTC has established a new advisory board to help us shape our artistic work over the coming years. As part of a new series of interviews, our commissioning editor, Edward Doegar, will be getting to know each new member of the advisory board. This month, Ed met up with the poet Mary Jean Chan at the British Library to find out why she’s interested in poetry in translation and how it’s changing her writing. What draws you to work in translation? I think translation has always been fascinating to me because I am a bilingual speaker (and reader). 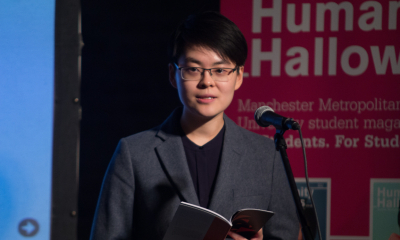 Growing up in Hong Kong until the age of eighteen, I learnt both Chinese and English literatures, but chose to focus on English Literature in my late teenage years, partly because I was good at it, but also because I was increasingly finding queer traces within English texts (e.g. Shakespeare's fondness for playing with gender in his comedies). I've written elsewhere (i.e. in the journal Modern Poetry in Translation and on the website Wild Court) about navigating a kind of split in my linguistic consciousness, during which I found myself drawn increasingly to queer American voices during my time at university in the US, such as Adrienne Rich, Audre Lorde, Allen Ginsberg etc. During the past year or two, I've been trying to slowly find my way back to Chinese texts, and reading Chinese poems in translation has been something I've been enjoying, even though I could easily read the Chinese version! In terms of my own reading beyond English and Chinese works, I've always loved reading poets in translation, including Wislawa Szymborska, Rainer Maria Rilke and Octavio Paz. Tell me about your practice and the particular constraints and possibilities of multilingual poetry? I think multilingual poetry (whether it's a book of poetry in translation where you get to read the original and the translated text side-by-side) or poems that incorporate more than one language are crucial in challenging the hegemony of the English language, and to remind English speakers (myself included) that there are a myriad of ways to view and understand the world we live in. Recently, my partner has been learning Mandarin Chinese quite intensively, and I've found myself trying to explain the meanings of certain Chinese characters to her, which has in turn prompted me to think more deeply about a language I largely take for granted. For example, a word I love is the Chinese word for "tea" ("cha" 茶), which, if broken down into separate components, means "a person standing in a field of grass and trees". That's the feeling a good cup of tea is supposed to give you - it transports you to a place of serenity and peace. I think knowing another language can only be good for one's poetry, but I think I'm only beginning to consider the complexities of using Chinese in my own work, since I want to do so in a way that isn't tokenistic or arbitrary. When writing multilingual poetry and writing across linguistic and cultural borders do you have to consider who you’re writing for differently? I don't really write with an audience in mind; I think for most poets, an awareness of audience comes after the poem is created. That said, having been involved in the Ledbury Poetry Critics programme for the past year, I've learnt a lot about literary review culture in the UK, and the ways in which BAME poets in particular have been (and are still being) received. Sometimes there is a sense that whatever you write, no matter the nuance, your work will always been read as "identity poetry" or "ethnic poetry", even when you're writing about a mother-child relationship or something as specific as a sport you love. I think everyone (white poets included) write "identity poetry", because surely being white (and say, English and a Londoner) is as much an identity as being Chinese and from Hong Kong? There's also the added complication of being someone for whom English is a second language; I often get asked if I write in Chinese - or if I don't, why not? That comes both from Chinese audiences and non-Chinese audiences alike, with differing implications. In light of all this, I've found a lot of comfort in Vahni Capildeo's line from her wonderful book Measures of Expatriation, where she says: "language is my home, I say; not one particular language." Lastly, I think I am aware that my work has different implications when it is being read in Hong Kong, for example, versus in London, despite both being large cosmopolitan cities. In Hong Kong, my poems on queerness might be read as a provocation, or as part of a radical politics/poetics; here, they've been largely warmly received, and that's quite interesting for me as someone who returns to Hong Kong twice a year, and who calls both Hong Kong and London home. Do you feel your work is part of a contemporary tradition and if so who do you feel a kinship with and in what ways? I sometimes think of myself as being a bit disloyal to a particular kind of tradition; since I don't really refer that much to classical or contemporary Chinese poetry in my work (even though I'd memorised many of their poems as a child). Rather, I've felt a kinship with poets from a wide variety of backgrounds, and from all around the globe. In particular, I've found solace and inspiration in the works of queer poets, and poets of colour, but it would be hard for me to list specific individuals to the exclusion of others. Recently, I've been teaching the poems of Terrance Hayes, Claudia Rankine, Kei Miller, Sarah Howe, Ocean Vuong and Liz Berry to my students at Oxford Brookes, so perhaps this reflects a bit about my sense of kinship with specific poets at this moment in time. I like the idea of being disloyal to a tradition, perhaps at the PTC we’re trying to cultivate a sense of global disloyalty. Tell us a bit about your book? I'd say it's a collection which examines relationships at once conflictual and tender, much like the épéeist (I practiced fencing for twelve years) who must constantly negotiate her relationship to her opponent during a match. Overall, themes of queerness, post-colonialism, language, psychoanalysis and cultural history emerge through a personal, maternal and national biography conveyed by a polyphony of female voices. You can find out more about Mary Jean Chan and the other members of our advisory board here.